The restoration economy evolved slowly over the past 40 years as states from New York to Colorado to California realized it was often more efficient to restore natural systems that protect coasts and manage water than it was to build substitutes from concrete and steel. The city of New York, for example, long has saved money on water filtration costs by paying farmers in the Catskills to restore natural grasses that absorb farm runoff, while Denver is funneling water utility fees into forests that store and filter water, and California uses meadows and streams to filter and store the water that feeds into its famous aqueducts. Closer to hurricane territory, Texas is home to one of the country’s largest for-profit restoration projects, while studies have shown that Louisiana can earn billions by restoring its coastal mangroves — or lose multiples of that by letting them die. Some of the most innovative thinking on restoration economics comes from hurricane territory, but political leaders there have been slow to adopt the recommendations. Here are 10 things you need to know to understand the restoration economy. 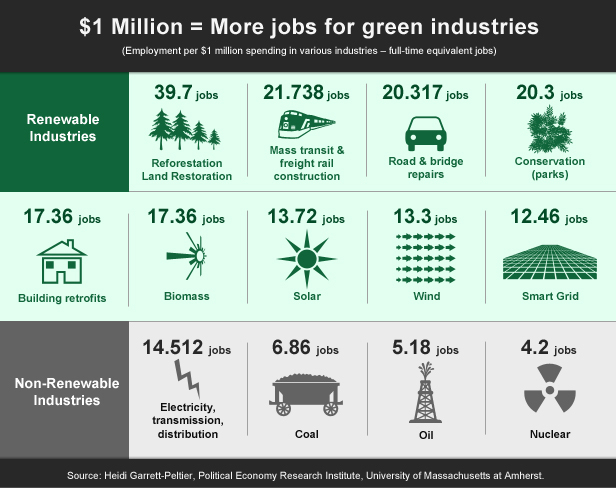 The restoration economy is not to be confused with the renewable energy boom (PDF) that employs 374,000 people in solar parks and 101,738 on wind farms. Like those, however, the restoration economy is part of a burgeoning "green economy" that’s transforming forests, farms and fields around the world. State and federal governments helped the wind and solar sectors get off the ground, but both sectors are humming along on their own because they provide a cost-effective way to produce electricity, which everyone needs. The demand for restoration, however, isn’t that automatic, because most companies and even some landowners won’t clean up their messes without an incentive to do so. Economists call these messes externalities because they are internal responsibilities that are dumped on the external world. Governments are created in part to deal with externalities — traditionally through "command-and-control" regulation, but also through systems that let polluters either fix their messes or create something as good or better than what they destroy. Under the Endangered Species Act, for example, a local government that wants to build a road through sensitive habitat can petition the Fish and Wildlife Service for permission to do so. If permission is granted, it still has to make good by restoring degraded habitat in the same region. Pioneered in the 1960s, environmental markets offer flexibility in meeting commitments. That local government mentioned above, for example, either can restore the land itself, or it can turn to a conservation bank. These are usually created by green entrepreneurs who identify marginal land and restore it to a stable state that performs ecosystem services such as flood control or water purification. Conservation banks make money by selling credits to entities — personal, public or private — that need to offset their environmental impacts on species, wetlands or streams. 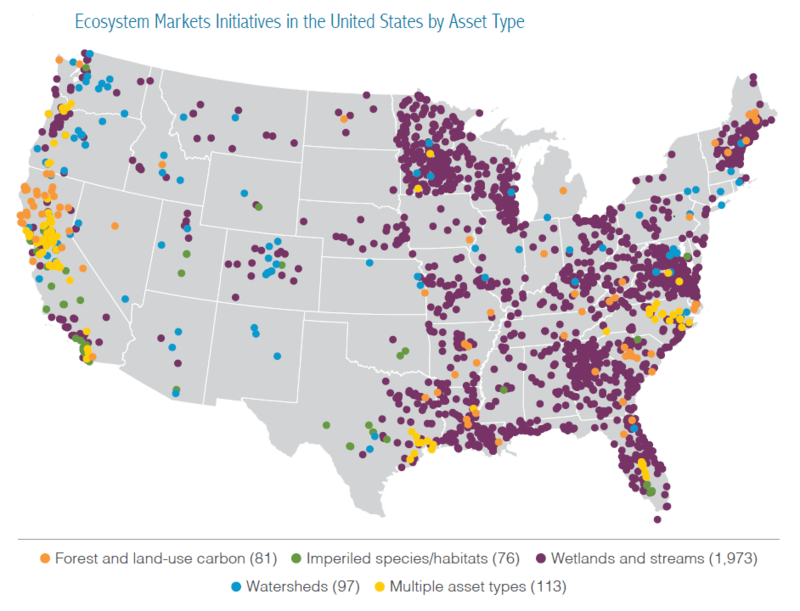 At least $2.8 billion per year flows through ecosystem markets in the United States, according to Ecosystem Marketplace research. The federal government — especially the military — holds itself to high environmental standards, as do many states. Government activities alone support thousands of restoration jobs. Government agencies are big buyers of credits, often because they need to offset damage caused by infrastructure projects. The link between infrastructure and restoration, however, goes even deeper than that. In Philadelphia, for example, restoration workers are using water fees to restore degraded forests and fields as part of a plan to better manage storm runoff. In California, meadows and streams that control floods are legally treated as green infrastructure, to be funded from the infrastructure money pot. Green infrastructure, it turns out, is prettier than concrete and lasts longer to boot. Nature is complex, and rigid regulations often fail to address that complexity. Environmental economist Todd BenDor, for example, points to well-intentioned regulations that require the placement of silt fences in new subdivisions along waterways. "They’re supposed to prevent erosion, but they often fail or are put in the wrong places," he said. "Markets can simply enact a limit on erosion, allowing the landowner the freedom to be creative and efficient in any way they see fit in order to meet that limit." Done right, environmental markets can replace overly prescriptive regulations, but they still require government oversight and regulation. "Markets are entirely reliant on strong monitoring, verification and enforcement of limits," said BenDor. "Provisions must be made to ensure that, but in reality, it’s often a problem." In 2015, BenDor published a study called Estimating the Size and Impact of the Ecological Restoration Economy, which found restoration businesses in all 50 states. California had the most, but four "red" states filled out the top five: Virginia; Florida; Texas; and North Carolina. Fifth place went to North Dakota. By their very nature, restoration projects are in rural areas, and a study by Cathy Kellon and Taylor Hesselgrave of EcoTrust found that Oregon alone had more than 7,000 watershed restoration projects, which generated nearly 6,500 jobs from 2001 through 2010. Many of those jobs went to unemployed loggers. "The jobs created by restoration activities are located mostly in rural areas, in communities hard hit by the economic downturn," report authors wrote. "Restoration also stimulates demand for the products and services of local businesses such as plant nurseries, heavy equipment companies and rock and gravel companies." Last year, the U.S. Department of Agriculture’s Office of Environmental Markets, together with Ecosystem Marketplace publisher Forest Trends and the Environmental Protection Agency, published an online Atlas of Ecosystem Markets, which you can access here. Environmental regulations didn’t kill coal; natural gas and renewables did. Regulations didn’t stifle the western oil boom, either; that was low energy prices. 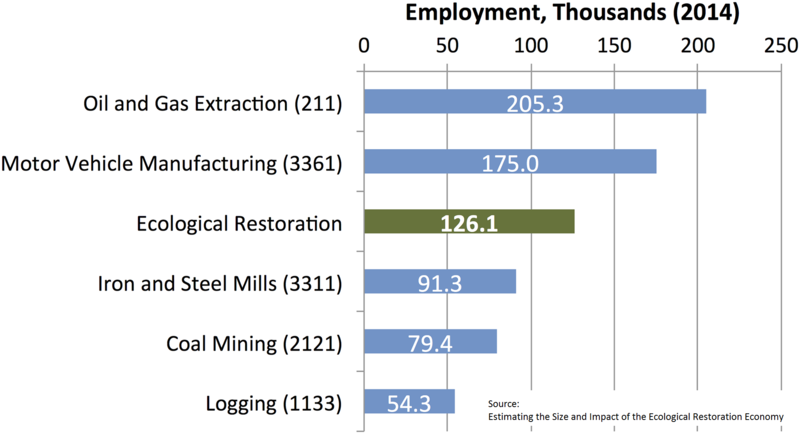 Even if Trump's federal government does prop the coal sector, jobs won’t go to people; they’ll go to machines, which took most of the jobs (PDF) America lost in the last decade. BenDor’s research shows restoration jobs are evenly divided among white-collar planners, designers and engineers and the green-collar guys doing the actual earth moving and site construction. Almost all involve time in the great outdoors, and they can’t be exported or done by robots. Because restoration work is labor-intensive, the money goes to people instead of machines, and every $1 million invested generates 33 jobs on average. Every $1 million invested in oil, on the other hand, generates 5.2 jobs per $1 million invested. In coal, the figure is 6.9 jobs. Some industry groups claim the Endangered Species Act blocks development, but researchers reviewed 88,000 consultations between 2008 and 2015 and found that no projects had been stopped or even changed in a major way to protect habitat. The Green New Deal would boost the restoration economy. What does that mean?